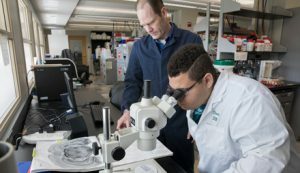 Binghamton University can now count itself among the 131 elite universities in the nation that have achieved the “very high research” classification by the Carnegie Classification of Institutions of Higher Education. “This is exceptional news that will have a far-reaching impact for Binghamton University,” President Harvey Stenger said. “Being recognized as having a significant research presence among other top universities in the nation is a testament to the quality of our faculty and those who conduct research at Binghamton. “This classification underscores the innovative work of our researchers as well as the importance of research funding on our reputation and for the growth of our graduate programs — two key measures that we are continually growing faster than our peers,” Stenger said. Donald Nieman, executive vice president for academic affairs and provost, said the designation will help the campus recruit faculty, deans and others to leadership positions.